From time to time I will present some painted minitures of diverse tabletop games. So far I have collected some for Warhammer Fantasy Battle and some Battletech miniatures. All models were painted by hand mostly by paint and drybrush, some with paint, washing and drybrush for highlights. 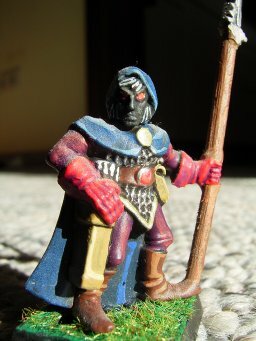 I started collecting my miniatures in 1985 with no particular goal for our pen & paper sessions. A friend of mine showed me his (als very chaotic) collection of diverse miniatures, some painted, some not. Since then I have been painting and collecting miniatures by myself, and done some contract working in the past to paint armies for friends. Below you will find some thumbnails of selected models which are final. With a click to the larger screenshots and on the side you can find further Information on the painted models. Sooner or later I will split this section up into own pages for painting tips, modelling/converting and finished models. I have painted a lance for battletech by using the original colors from the macross mechs. As there is no shadow hawk in macross I had to improvise on the look. 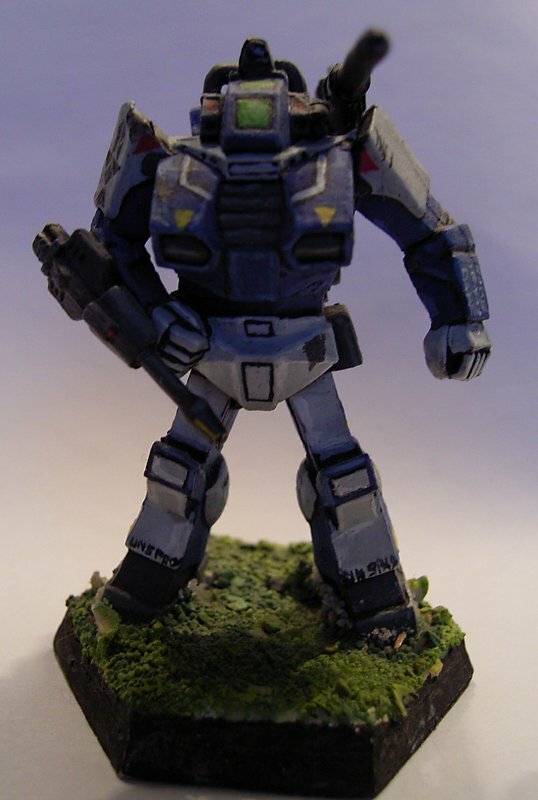 A shadowhawk mech painted in macross RDF colors. I painted my lance in Robotech/macross colors which I even adopted to thiis non Robotech mech. The mech has a special banner on his right arm resembling pieces of a tangram puzzle. The base was created by a friend of mine. Special thank's to Frank Adolf. The whole Battletech lance consists of a locust, a warhammer, a shadowhawk optional a wasp or a rifleman. I started with old style elves with crossbows, where the idea for the color set of my darke elf army came up. 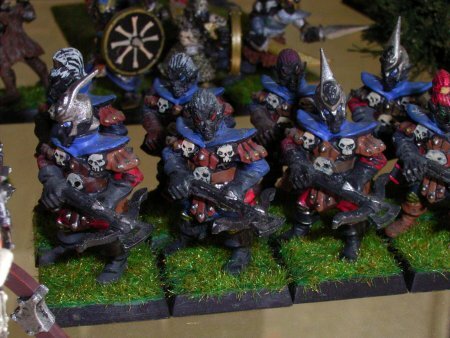 The basic color for my dark elves are red, blue and black. I don't know if anyone else paints his dark elves with black skin, but I do. Besides the forgotten realms, I think I am the only one in the warhammer world doing so. May the results speak for themselves. A unit of converted wood elves. 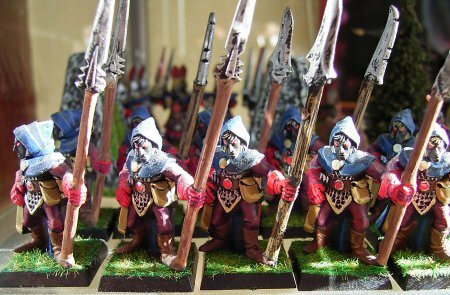 From the same army box as above, converted wood elf bowmen to dark elf spearmen. I came up with this idea when a friend of mine wanted to get rid of those wood elves. originally they were equiped with longbows. They were curved and extended from the left hand to the foot and upwards. To convert the models I just cut the bow fron the hand so the model was basically standing free with his left hand. Then I glued woodsticks in the actual positions. The spear tip came from rests of skaven weapons which also were part of the box in that time. The final step was the painting with the same procedures as above. You can see a gemstone in his belt bucket painted like this: ground the base with red (for example) then mix your basecolor with white or yellow to get a lighter color. Paint a broad half of the circle (a curve) with the lighter color, then repeat this step thinning the color and thinning the circle from center to the outer edge. As a last step paint a very bright color on the edge halfcircle itself. Picture of a dark elf warrior as released around 1995 by games workshop. Still painted in army colors. 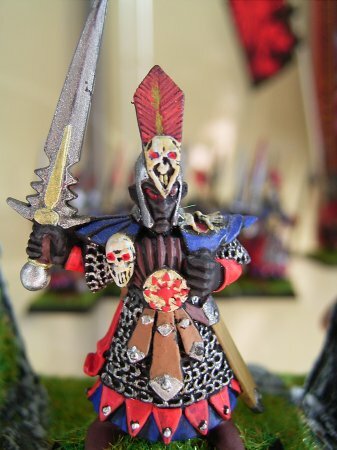 The model was painted like all other dark elves. The two monoliths left and right were made of a egg cartonage. The fabric has its own structure so the only thing necessary is cut the egg separator from the box, glue it to a cardboard and finished you are. Ok, grounding and drybrushing, and perhaps a slight application of grass or sand. But that's realy all. And with a couple of those monoliths you can create mystic circles, elven waysigns, etc. 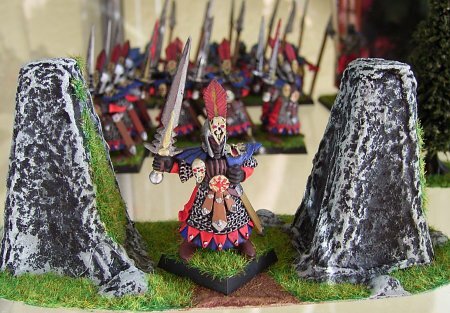 This is a closeup of the above picture concentrating on the dark elf.